Emma Leadbetter, in an essay written when she was a third-year undergraduate, describes Tennyson's membership of an exclusive Cambridge society known as the Apostles, and begins to draw links between Tennyson's biography and his poetry. Tennyson arrived at Cambridge early in 1828. His brothers, Frederick and Charles, had begun their studies the previous year. Charles and Alfred were close, and both were regarded as promising young poets. Over the next few years, the brothers wrote and published their first individual rather than joint collections: Charles' Sonnets and Fugitive Pieces and Alfred's Poems, Chiefly Lyrical. Tennyson was one of a growing number of well-educated middle-class scholars, and quickly found like-minded friends among the students at Trinity. It was perhaps through his friendship with Arthur Hallam that he first came into contact with 'The Apostles'. The Cambridge Apostles were a secret society of young intellectuals - mostly undergraduates, and mostly members of Trinity and St. John's Colleges. Founded in 1820 as the Cambridge Conversazione Society, the club met weekly to hear a presentation given by a member on some philosophical, political or literary topic. The name 'Apostles' most likely came from the fact that there were never more than a dozen active members. The process of being elected to the club was shrouded with secrecy, and invitations to new candidates - or 'embryos' - were only made with the full consent of every member. Tennyson was invited to join in 1829. He had made a great impression on the society's members and came to be known as the 'Poet of the Apostles'. His relationship with Arthur Hallam, an influential member of the society, drew him into further close friendships. Of the young men who made up the twelve apostles (women were not admitted until the 1970s - although it was already a matter for debate by the end of the 1830s), the most prominent were Hallam, Richard Monckton Milnes, John Sterling, Frederick Maurice and Richard Trench. All of these men influenced Tennyson to a greater or lesser extent and became his lifelong friends. Richard Deacon, in his history of the Apostles, describes the 'cult of friendship' predominant in the society in these years, which placed good company and platonic friendship above intellectuality as an . Tennyson did not greatly enjoy his time at Cambridge, writing to his aunt that . Despite the warm approbation of his poetry by the Apostles, he did not immediately take to the club, and only attended meetings irregularly, running up a fine of five shillings for his unexplained absences! When asked to give a paper on the subject of 'Ghosts', Tennyson was unable to complete it, tore it to shreds, and resigned from the society on the spot. Nevertheless his friendships with several of his fellow members continued, and as well as continuing a regular and affectionate correspondence he wrote several epistolary poems addressed to them (for example, 'To J.S. ', and 'To the Reverend F.D. Maurice'). In 1855 he was unanimously readmitted to the society as an 'Angel', or . Tennyson's sense of humour, his stubbornness and his impulsiveness, are not necessarily the qualities that we most associate with the poet, thinking of him more as the distinguished Laureate and scholar of the 1850s. It is true that the frivolity of the society was only one of its facets, and that serious political and philosophical discussion was also characteristic of their meetings. The revolutionary ideas on which the club was originally founded had subsided after the bloody end of the French Revolution, and instead most of its members were liberal conservatives, holding personal freedom of expression as a key intellectual , whilst supporting traditional British values. There was a strong belief in the value of argument for its own sake, and free thinking was encouraged, especially on the subjects of religion and philosophy. These ideas were to remain intrinsic to Tennyson's thinking as expressed both in his poetry and prose. And all the framework of the land. The nostalgia for his youthful energy and passion is contrasted with his sobered and distanced feelings on his return to these once-familiar rooms. These stanzas highlight that strange combination of boyish exuberance with a real fervour and idealism for 'mind and art / And labour, and the changing mart'. The notion of things, and of the poet's own self, being 'The same, but not the same' is pervasive in In Memoriam. But its gloominess and expressions of regret also show these times to have been profoundly affecting and meaningful in shaping Tennyson's adult life. He left Trinity without a degree, in part on account of his father's sudden death, and in part owing to his inability to flourish in the academic environment of the university. However, the intellectual influence of the relationships forged during his time with the Apostles remained a constant feature of his best poetry, as well as a source of comfort in his personal life. Deacon's book on the Apostles is mentioned above; there are several others, because the society has some famous and some notorious former members (including E.M. Forster, who also features in this site). W.C. Lubenow, The Cambridge Apostles, 1820-1914: Liberalism, Imagination, and Friendship in British Intellectual and Political Life (Cambridge, 1998), covers the early years of the society. 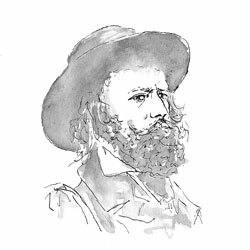 This essay draws attention to some contradictions in Tennyson's character. What do you think happened to the exuberant youth who enjoyed vigorous discussion of unconventional matters? Do you think Tennyson is often a nostalgic poet? Argued over / sorted out in a high-spirited way. The quotation comes from Matthew Bevis, ed., Lives of Victorian Literary Figures (London, 2003), vol. 3, p. 15. This entry was posted on Wednesday, May 6th, 2009 at 10:32 pm	and is filed under Tennyson. You can follow any responses to this entry through the RSS 2.0 feed. Both comments and pings are currently closed.